Summary: Sonic CD bridges the gap between his oldest adventures and his new digital exploits. If you're a fan of Sonic games and you haven't finished Sonic CD you owe it to yourself to check out this title - scratch that... if you're a fan of platformers, this remastered version is something you need to own. All told, Sonic CD was a masterpiece long before it appeared on the App Store. This wonderful mobile version only helps solidify its standing as one of the greatest video games of all time. Sonic CD is a terrific port of a great, under-appreciated Sonic game. Well bad news for a-holes, but good news for Sonic fans: Sonic CD is on iOS, lovingly recrafted, and you can all enjoy the hell out of it. Featuring your favorite characters, retro visuals, and lightning fast speeds, Sonic CD is a particularly well-developed port that easily exceeds our expectations. A faultless conversion of what is arguably Sonic's most accomplished adventure, Sonic CD on the iPhone combines amazing presentation with a surprising degree of depth and playability. 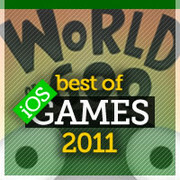 This peerless 2D platform escapade is a must for any self-respecting iPhone gamer. Sonic CD was a great game in 1993. Today we can't put two hands in front of our eyes and ignore its flaws. Sega does a great job in mantaining the same old running atmosphere, but are we sure that it can still give to a 2011 user what he wants? Looking for something to do with your iOS device over the holidays? We recap the best-reviewed iPhone and iPad games of the year.